A "crack pipe" vending machine, as identified by officials in the town of Brookhaven, New York. 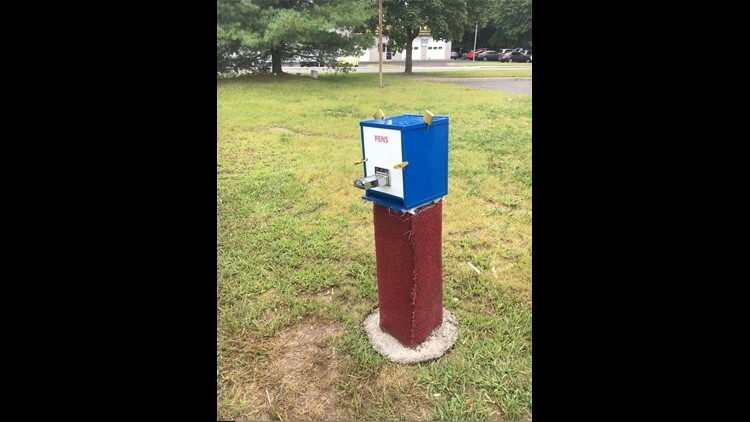 Complaints came in to officials in the Long Island town of Coram: A vending machine selling "crack pipes" had quietly appeared in front of a shopping center on Middle Country Road. A second machine, also in Coram, was identified as local authorities investigated who placed the devices, according to Brookhaven town officials who oversee the community. Councilman Michael Loguercio received a call Friday from a fire department official "with regard to what appeared to be crack pipe dispensers, disguised as pen dispensers," he said in a statement this week. That kick-started an investigation between Brookhaven and Suffolk County officials to identify who placed the machines. While the blue-and-white boxes featured the words "Sketch Pens" across them, per WABC-TV, Brookhaven spokesman Jack Krieger told CNN they are "actually repurposed tampon dispensers." Once eight quarters were inserted, the machine produced "pens" consisting of ink, a glass tube and a filter, WABC-TV reported. Loguercio, the councilman, told the news agency the products are considered drug paraphernalia and were sold in an illegally installed machine, according to town code. Supervisor Ed Romaine said in a statement that Brookhaven would work with Suffolk County police "to identify more locations and will cooperate fully to find those responsible."